Ekaterina Sytcheva, myself and Randi Winter. It is always so exciting to sit down that first day of runway shows at Vancouver Fashion Week (VFW). As people start to filter in, I get to reconnect with so many amazing industry friends I haven't seen over the summer. Snapshots abound as we try to capture the moment. Then there are all new and gracious people I meet. We laugh, share names and sometimes business cards and just generally enjoy the experience of getting to know someone new. I have been attending VFW for 10 years now - that's 20 seasons. I used to come dressed in nice clothes like you would wear to an office or an evening out and would stand out. No longer! In the last 3 seasons the bar has risen about 1000%. Now great eye wear, interesting hats and ensembles that rock the event in a new an exciting way. Vancouver now pulls out all the stops and as everyone works to express a style that is much more East Coast and out of the box. It's the chance to have fun and wear outfits that may not find a place in everyday life - tutus, hats made from golden eggs and more. I particularly love seeing some of the men step out of the tight confines fashion often puts them in and rock a unique new take on what menswear could be. from past season of VFW! the Optical Boutique and her son Liam. This season I was fortunate to up the ante this first day with the help of several local talents. My ensemble was from Rozemerie Cuevas of JAC - a semi sheer tunic and leather look leggings. They are classics that have been in my closet for a few seasons and great basics to build on. courtesy of Sue Randhawa of the The Optical Boutique. They definitely were a showstopper - especially as it was a new look for me - and I ended up snapping a few shots with others wearing them. 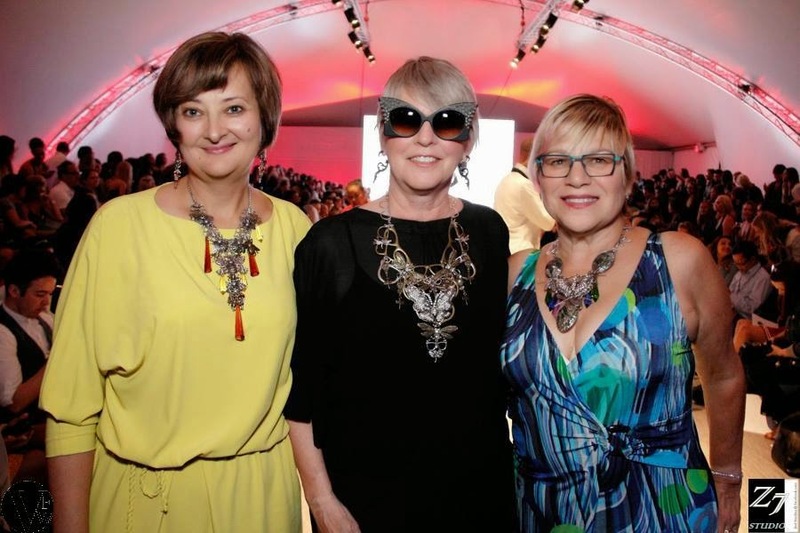 Paired with the eye wear was another great necklace from Carolyn Bruce. Last season I work one with spiders and bugs. This night the theme was eyeglass frames. Again - another showstopper. As I really am not great at make-up - and in packing to move can't even find mine at the moment - I topped it all off by having my make-up done professionally. What a treat and it really was the icing on the cake. Time to get more serious about the make-up as it really does make a difference. I only have time to cover a few designers each day and it's always such a tough call. There are many worthy ones, but I think the ones here showcase the variety seen yesterday. I have decided to write a separate article on Evan Clayton with a Q and A so be sure and check back for that in a few days. This collection made me sit up and take notice, so this morning I took a moment to look at her bio on VFW and no wonder. Art - Paris - New York City, need I say more? Looks were feminine and oh so chic. Fabrics were luxurious. The palette was soft and enticing. Silhouettes and proportions well-thought out. There were many looks I would love to own here. Bio from the VFW website - "Born in Paris, France, Priscille grew up in an artistic environment during her childhood. Interested in Architecture & Fashion she worked a few years for Lecoanet Hemant Haute Couture Paris and entered the famous Parisian Interior Design School ESAG Penninghen, to expend her sense of design. In parallel, she also went to Parsons School and RISD in the US. After her graduation she worked as a designer specialized in French classic architecture for castles. In 2007, she decided to leave her beloved Paris to fulfill her dream in the electric New York City, where she worked as a visual designer for projects all around the globe and also designed Couture gowns for private clients. Of those two passions PRISCILLE CANIVET’s brand, is born: a Ready-to-Wear & Couture line, proudly Made in France, each piece of the collection is crafted with the best quality fabrics from Europe and the Couture “savoir-faire” techniques, to exquisitely fit and emphasize the beauty of women’s body." I always love seeing menswear on the runway, so truly enjoy this small collection by Shinya Yamaguchi. Not a lot out there as far as background on the designer, but in looking at a translation of his website, he has been designing since F/W 2009. 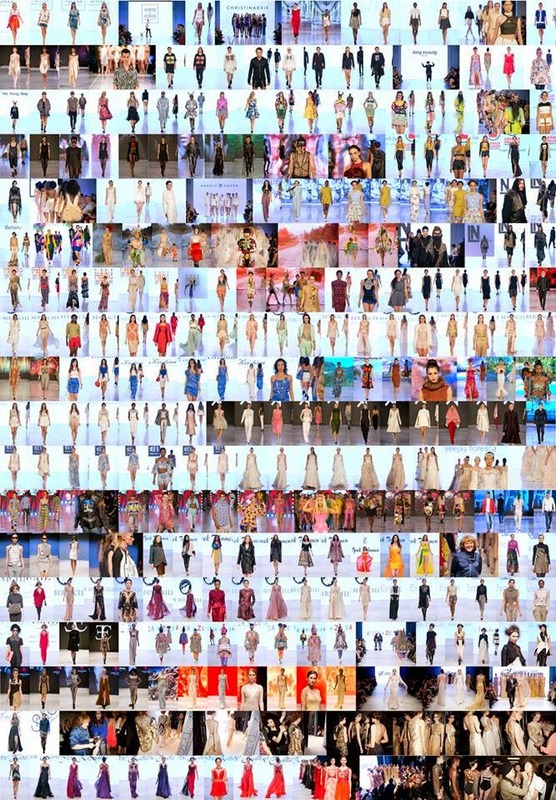 The collections feature great names such as - 2013AW "ROCK TO THE FUTURE", 2013SS "BASKET COUTURE", 2012AW "STREET COUTURE", 2010AW "A NEW HOPE", 2010SS "SENSAI STRONG" and 2009AW "TOKYO POP GOTHIC. 2014 S/S has been given the title - FUTURE hippie. Here is an excerpt from his VFW bio -This designer was born in Yokohama, Japan. Shinya Yamaguchi graduated from The Tokyo Media Academy Artists, Stylists and Designers Vocational School. Shinya has won a total of 3 awards including a gold award during his time at school.Shinya has managed to create his own brand with using only a single pair of shoes that were made in 2009. A Japanese media company, “Tokyo Kawaii TV” recognized his talents, and helped market his brand.Shinya Yamaguchi has collaborated with RYNSHU at the Paris Men’s Collection in 2010AW and 2011SS. Shinya’s brand and designs has been worn by Japanese models, musicians and celebrities. Currently the name of his brand/company is “Long Tall Tokyo”. His focus is on creating a new trend with the new generation of people in Tokyo street culture. I can't seem to find any about Akira Kuwabara on Facebook or in a web search, so all I can offer you in background is the bio from the VFW site - "Akira Kuwabara has many thoughts towards clothes, but his greatest thoughts would be to make people happy through fashion. Clothes prove it’s value only when it provides happiness in people’s lives. This designer wants to share those moments with his fashion and design. In addition to making people happy with his apparel, he also wants to make the surrounding environment into a happier atmosphere. This is the kind of clothing he wants to create." Vancouver designer Shelley Klassen is one I have been writing on and following for such a long time that it gets hard to know what more to say. She is a Vancouver icon. She designs for first and foremost for women and has a strong loyal clientele who appreciate her flattering aesthetic. Here is an excerpt from her VFW bio - "Designer Shelley Klassen has built her career by creating an irresistible feminine style of chic women’s clothing...Currently in her 15th year as designer for Blushing Designs and her eponymous label, Shelley Klassen, and now a more youthful label, ‘Story of a Girl’, Klassen offers a wide range of beautiful, wearable designs. I loved the new younger silhouettes that have been added to this collection - the shorter tops paired with fitted skirts that let a bit of midriff show. My favourite was definitely the black crop looser crop top with the turquoise skirt seen in the images above. While I don't have a great midriff myself - I think those sheered skirts are amazing and here is my notice Shelley - I need the turquoise one in the centre. Let me know when it's available. There were still a few of the traditional pin-up style dresses she is known for, but overall the looks were sleeker with a very modern twist. You can check out my previous 2 articles on this designer HERE and HERE. - in the role of Creative Director and Lead Designer. Her supportive husband embraces the business side as President. Here is an excerpt from the VFW bio - Dawson & Deveraux is an emerging global and independent fashion house founded on the principles and interplay of contrast, balance, rhythm, and scale...Through infusing quality construction, clean lines, and our multicultural perspective into each piece we strive to inspire moods and attitudes that make women feel and look their best. The opening of their show had a touching tribute to those dealing with breast cancer. The designer had a best friend diagnosed with Stage 4 breast cancer and the news was devastating. In response, 20% of every sale will be donated to fund breast cancer research, awareness and needed services for patients and their families. As well, a Go Fund Me campaign has been launched. In this show, I saw a growth from last season. The pieces I most enjoyed offered 2 elements - asymmetry and a play between textures. Although the line is more diverse, I tried to showcase those including these 2 elements in the pictures chosen.